It is the most magical time of the year! The winter season make us visualise snow, pine trees, golden wreathes and much more. You can see and smell the celebration and festivity in the atmosphere, and your dream winter wedding can have this atmosphere too. Choosing your flowers is an important part in making your dream winter wedding, not just a wonderland, but a fairytale like event. In planning your winter wedding, flowers are one the most important details to prepare. The flowers you choose can completely change the look and feel of your winter wedding. You may be worried that the perfect flowers will be difficult to find because of the season. Well, worry no more, because we’ve got you sorted! We have prepared a beautiful list of flower ideas that are perfect for winter and will add a lovely touch to your winter-themed wedding. Hand-tied with a white ribbon, this avalanche rose bouquet will compliment any colour gown. So, you don’t need to worry if you change your mind to a different colour of dress. This flower idea will be as perfect was you on your wedding day. Never be afraid of playing mix and match with your flower arrangements and ideas. Mixing orange and greens will add a little more festivity to the atmosphere of your winter wedding. You can also add other touches of colours that you think will partner well with this combination. You might choose to decorate your chairs with different flower arrangements and ornaments. To add a wintery touch to your wedding chair decorations, you can attach small bouquets of white roses and green leaves. For a more Christmas-style theme, you can also mix it with red roses and greens, or berries and laces. Use your imagination and you will have beautifully decorated chairs that attract the attention of your guests. White anemones with gypsophila makes a bouquet perfect for a winter wonderland wedding. Anemones are typically in season from October to May, they are available in various colours with white being one of the most popular varieties. Your white winter wedding will be as serene as these anemones, if you add them to your wedding flowers. This beautiful and elegant centerpiece is made of calla lilies with an accented glass vase. These flowers are very popular with the brides as these are very graceful and compliment other wedding decorations easily. Of course, the wedding cake! You can always add some red roses and berries for this cheese winter wedding cake. Red roses and berries are the perfect partners for rustic-style cakes like this. Also, to top it off, you can add one big rose sitting prettily on the top as the last layer of the cake. This will add to the aesthetic beauty of your winter wedding. This white ranunculus is perfect for the buttonholes of the groom and groomsmen. These flowers also come in different colours, so you can play around with your ideas. Ranunculus are very adaptable depending on your ideas. Generally, they are available in the UK from December until May. The winter season brings rich evergreens and berries which can be incorporated into an arrangement for your wedding. Also consider adding other elements such as roses, pine cones and feathers for a more wintery effect. Dramatic garlands are perfect for staircases, table arrangements and more, for people planning a winter wedding. You can never go wrong with a bouquet of red roses. This flower is perfect for your formal winter wedding. The bride in white will also glow and contrast while holding this deep red bouquet. You can also add some greens and laces to add more of an accent to your typical red roses. Wearing a wedding crown is very “on trend” lately, with pale winter shades being particularly popular. Wedding crowns made from green foliage, pinecones and flowers in shades of pink and ivory have a flawless look that is perfect for a winter wedding. However, reds and yellows will also look top notch on that crown, if you’re looking for some stunning contrast. Available all year round, carnation flowers are famous for its spicy scent and low-cost price. This makes them very desirable and the “go to” flower idea for a winter wedding. You have a wide variety of choice when it comes to this flower. Carnations come in hues of orange, pink, purple, red, and yellow, as well as bi-colours. So, you can mix and match these flowers for a perfect centerpiece on you winter wedding. 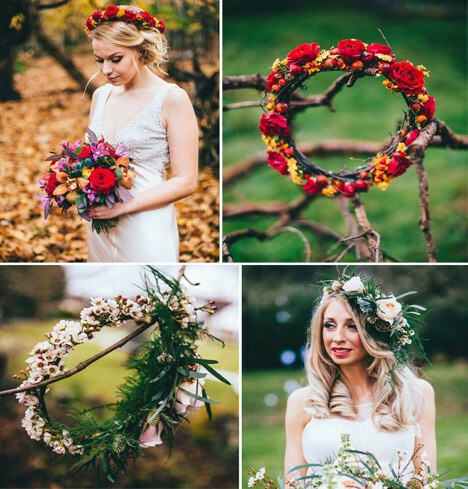 Hopefully, we have helped you start your journey to deciding on your winter wedding flowers. There’s lots of ideas to choose from, so don’t get too overwhelmed and best of luck. Why not check out the fantastic wedding florists in our wedding flowers section.